Aegg, creative packaging specialist with head offices in the UK and suppliers to global food and beverage brands, will be showcasing its new range of products at Packaging Innovations’ stand number E8 on 14/15 September in London, UK. The new plastic products include the bespoke engraved pots for luxury pudding brand Pots & Co which are available on most British Airways flights, as well as the 140ml brimful capacity dessert pots, for which Aegg invested €1.4M in the high volume packaging process. Aegg will also have a limited supply of Pots & Co desserts in Aegg packaging to offer to visitors at its stand over the two days, whilst stocks last. Since exhibiting at the previous February Packaging Innovations event in Birmingham, Aegg has been busy working on a range of new products as well as investing in bespoke automation and packaging solutions, the results of which will be on display at the Aegg Packaging Innovations stand E8 n London on 14/15 September. 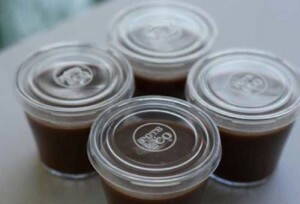 The 75ml injection moulded plastic dessert pots produced for luxury pudding brand Pots & Co include an embossed clip-on lid, which has been automated as part of the overall production line to provide efficiencies, whilst keeping the level of quality high. In addition, Aegg will be displaying dessert pots it has invested €1.4M in to produce efficiencies and a consistently high quality in the production line for this high volume product. The investment included a bespoke automation and packaging solution within a BRC grade A facility as well as committing to two new injection moulding machines and ancillaries, enabling the product to run full time 24/5 with weekend back up in event of any volume peaks. Aegg is a specialist food and beverage glass and plastics packaging company. Aegg packaging can be found in the premium shelves of all major UK supermarkets as well as on in-flight meals. All Aegg’s packaging is manufactured at accredited production sites. Its plastic products are manufactured in Europe, which lends itself to short lead times and flexible delivery options. Its glass is manufactured in world class production factories with recognised accreditations. Aegg offers both a catalogue of ‘off-the-shelf’ products as well as a turnkey project management service, with its own in-house design team, ideal for more bespoke or creative packaging.